There is something sweet and slightly painful about the babyhood of my second child. Maybe it’s that my memory of my first baby is slightly foggy and coloured by my knowledge of him as a toddler; maybe it’s that Monkey will likely be our last baby. I don’t remember the same sense of mine with Bean as I have with Monkey. Maybe it’s that I’ve learned to savour it, because as he grows he will not be just mine anymore. Maybe it’s that I’m beginning to know firsthand what all the elderly ladies who stop me in the grocery store say – it goes by so fast. Monkey’s smiles are still mostly for me. He looks into my eyes and his face lights up. I imitate his sounds and he chuckles. I enter the room and he looks for me. I sit down on the floor and he crawls over to me. At 8 months old, he is still mine. And I am selfish. I don’t want to share him, yet. His older brother is a part of the world. He has friends. He smiles and laughs and talks to other people. Bean is his own little person, and it is wonderful and beautiful to see him developing relationships and friendships and opinions and independence. But Monkey is still mine. I am his world. He is my baby. He fits on my hip; he belongs under my chin. His little body was so recently a part of mine, and our bond is still physical. What is it that changes this bond? It loosens and stretches without us being conscious of it, exactly. As our babies grow up and grow in independence, they grow away from us, bit by bit. Bean still needs me, and will always need me in some way, I hope. We will always be bonded, but nothing is the same as the elemental, physical bond of a mother and baby. 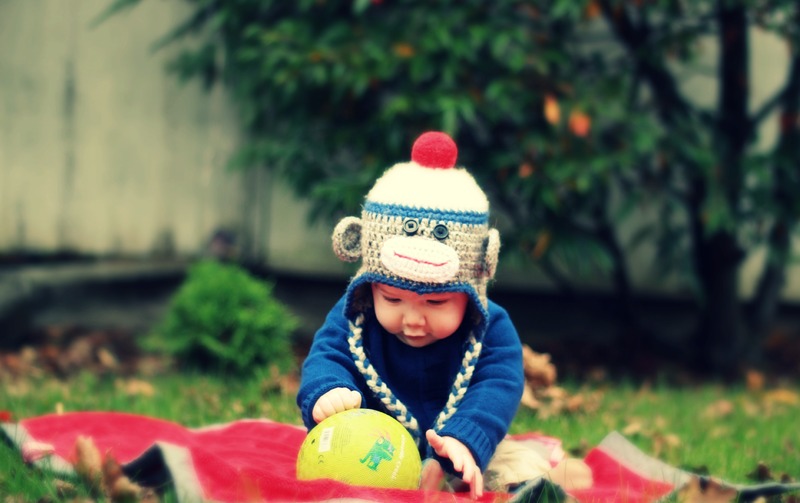 As I gaze into my Monkey’s sweet, smiling face and open, trusting eyes, I am struck by the gift that babyhood is. I am privileged to hold and nurture and protect a life that is pure and innocent. There is nothing dishonest in a baby – his smiles mean happiness, and his cries mean sadness, discomfort, or need. There is no guile, only instinct. And this baby stage is so fleeting. So I will hold onto my Monkey for as long as I can. One day I will have to share him, I know. As his small world expands day by day, I will explore it with him. Gradually my tight hold will loosen, and one day I will let him go. But not just yet. For now, he is still mine.